Butterfly mandalas are beautiful and highly symbolic. This symbolism is centered on the butterfly’s metamorphosis from caterpillar to butterfly, but there is much more to it than that. They are also indicative of your ability to gracefully let go of the old to embrace the new. The butterfly is the ultimate symbol of transformation, transcendence and personal growth. We often spend years of our lives in the slow, methodical caterpillar stage, crawling slowly to our destinations. When we go through periods of change, we can sometimes be stubborn and resistant to this new, unfamiliar territory. Butterflies signify the ability to welcome this change. If a butterfly catches your attention, he may be trying to tell you that transformation is imminent and reassure you that it will be okay. You are ready to accept the new situation, transform and gracefully glide into transcendence. Butterflies represent the embodiment of the divine feminine. Taking time out of our busy lives to quietly observe a butterfly as she visits the flowers in the garden gives us the opportunity to learn from her. The butterfly shows us a way of life that is filled with tenderness and grace. She opens our minds and hearts to a gentler energy and way of life. The butterfly mandala encourages meditation that helps us let go of old wounds and fears in a healthy way. Just as the transformation from caterpillar to butterfly within the cocoon takes time, our transformation can take time. This is especially true when you’ve been holding onto emotional pain from past injustices. Meditation with the butterfly mandala allows you to methodically let go of each wound. This process must be done so you can truly glide through transformation and transcendence. We must learn from the past and then let it go so that we may embrace change. This allows us to gracefully glide through new experiences like the butterfly. Butterfly totems represent your readiness to transform and transcend. They signify your power to choose your personal path toward your destiny. Butterfly mandalas symbolize your ability to pursue change and personal growth in your physical, emotional and spiritual way of being. Art and jewelry made with butterfly mandalas express your readiness to undergo your own metamorphosis from caterpillar to butterfly. They also support your efforts so that you can stay strong and steady throughout the process. Butterfly mandala art and jewelry are beautiful and useful. A butterfly mandala picture on the wall imparts a sense of beauty, grace and tenderness. It also signifies the ability to easily glide through transformation into transcendence. Butterfly patterns can include additional symbolism for more specific direction. A butterfly on a lotus flower, for example, enhances renunciation or letting go. This can encourage greater focus on the letting go of past injustices that is an integral first step to transformation and transcendence. With virtually unlimited butterfly color options, it is ideal for mandala art and jewelry. The butterfly’s color can be chosen to match your décor or an outfit. It can also be made with colors to help you balance your chakras in meditation. A necklace or pendant with a blue butterfly on a pink lotus will help you clear and balance the throat and heart chakras. These chakras, especially the throat chakra, must be cleared and balanced to allow you to examine past injustices truthfully and let them go. A healthy heart chakra will help you accomplish this difficult task in a kinder, gentler way. The use of natural gemstones and crystals can further enhance the power of a butterfly necklace, pendant or décor. Tanzanite, for example, has a powerful effect on the heart, throat and Third Eye chakras. It is an ideal crystal for healing, transition and transcendence. Include butterfly mandala coloring in your healing and transformation process. 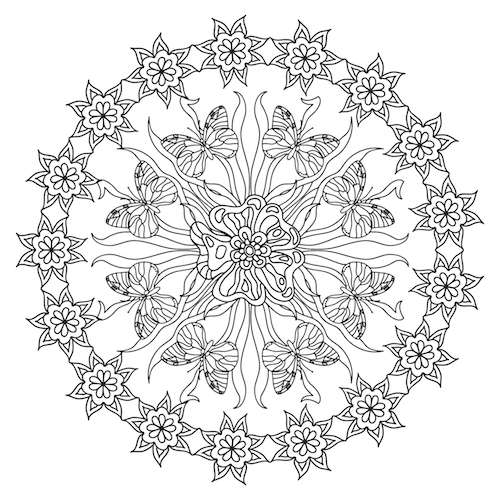 Mandala coloring sheets have been proven to be highly therapeutic. They can help you let go, recover and move forward. Butterfly mandala coloring pages can be found on-line and printed out to make your coloring experience easier. On-line coloring sheets are usually free for the taking. Select any butterfly mandala coloring pages you like. The images and patterns can include other elements to enhance the symbolism of the butterfly mandala. These other symbols will give you the opportunity to use more colors in the butterfly mandala images. Butterfly mandala stencil designs can be used to transfer your butterfly mandala to another surface. Transfer your beautiful butterfly mandala onto any surface you like using paint, markers, pencils and your own personal stencil designs. Tattoos of butterfly mandalas are permanent statements of your ability to accept change in your life and glide through transformation and transcendence gracefully. 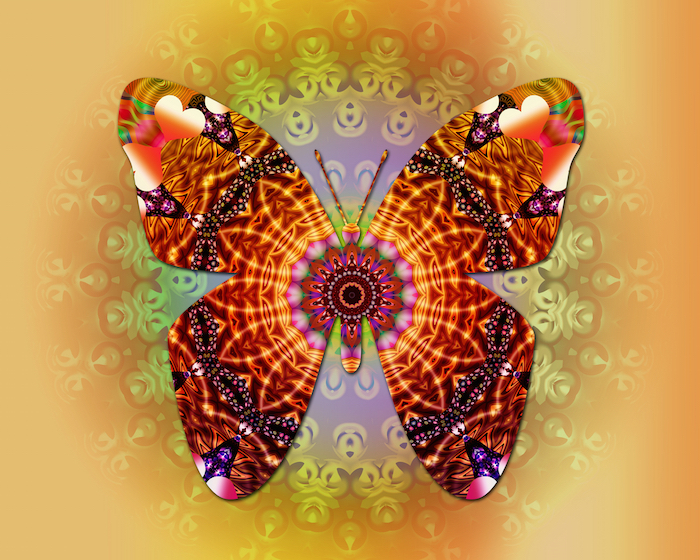 The butterfly or butterflies in the mandala can be any color or colors. They can also include other symbols like the lotus or a feather. The feather represents a free spirit, enlightenment, transformation and limitlessness. A peacock pattern butterfly mandala tattoo is beautiful and highly symbolic. Butterfly mandala tattoos should be put on a large, flat surface where they can be observed and appreciated in all their beautiful butterfly splendor. Variations on the mandala tattoo, like making it smaller or using a half-mandala design, work well on other areas as long as there is at least some flat area to work with.